Heavy rain in San Diego broke the previous record set more than a century ago in 1911 and was still falling Monday night. The National Weather Service office in San Diego tweeted just before 7 p.m. that the day’s rainfall had reached 1.68 inches, breaking the old record of 1.61 inches. Records were also broken in Alpine, Campo, Chula Vista, El Cajon, Escondido, Palomar Mountain and Vista. 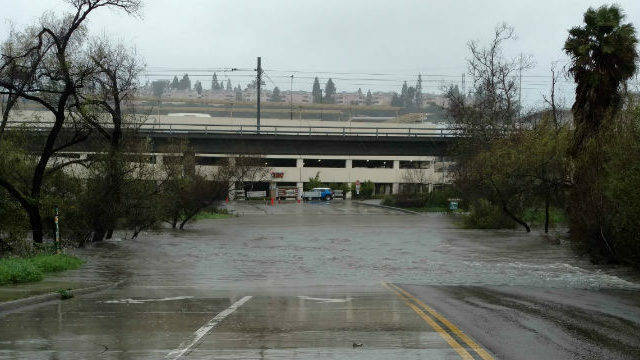 Many area roads were flooded, including the area around Fashion Valley, and there was concern that the nearby transit center would have to close. At 7 p.m. the San Diego River was a foot over flood stage in the area. The weather service said the rain would continue into Tuesday morning and warned that further flooding was possible.